We’re an Australian owned company and we’re improving the way houses are levelled. If you think of houses that are built on stumps, when the ground moves or settles, you need to go back in and adjust the levels, so you don’t get cracks in your walls and make sure doors open and close properly. The traditional way to do this is expensive, takes a lot of time and requires special equipment. With our LevelMaster products have an integrated retainer nut system which means you can basically level a whole house with a single spanner. REBLOCKING AND RESTUMPING ALWAYS ADJUSTABLE. LevelMaster is a patented and trademarked product used on stumped buildings, predominantly houses. It is stronger, easier and faster than using traditional stumps and it eliminates the need for boilermakers in the workshop or on site. The installation speed and easy adjustment also reduces total onsite labour and installation costs. Weld on: These are used by companies that prefer to welding to the top of the square hollow section stump whether they have in-house welders/fabricators or use they an external welding/fabrication company. Screw on: The most popular product which is tek screwed to the top of the square hollow section stump. The tek screw process does not disturb the galforce coating as no heat is applied and the strength ratings are more than adequate for Australian conditions. Engineers will specify the uplift requirements and each tek screw can render 10KN of uplift force hence the standard 4 or 8 screw options deliver 40KN and 80KN of uplift respectively. Why choose LevelMaster for your next project? Traditional methods of house stumping and house reblocking require heavy hydraulic jacks, packers, lifters and complicated machinery. One person with three simple tools can easily adjust LevelMaster house stumps. Most traditional house stumps are exposed and have a high chance of wear and rust. LevelMaster’s covered stumps on the other hand have a much lower risk or for moisture ingress. LevelMaster’s stump tops are fully hot dip galvanised after fabrication hence a superior life expectancy. In the past, traditional house stumping or reblocking can take up to 3 weeks to completely level a house. LevelMaster tools can get your house level in less than half of the traditional time. Other stumping methods can be costly to install, as they require specialist tradesmen with high ongoing costs. 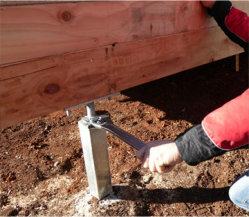 LevelMaster on the other hand is quick and simple to install saving on labour costs. The maximum legal height with traditional re-stumping/ house levelling and house reblocking is 50mm. Level Master’s galvanized house stumps have a max height of 120mm of adjustment due to their unique design. LevelMaster’s products are all prefabricated, not only can you rely on their accuracy and consistency. The stocks are all fully galvanised and ready to be shipped.